How to draw a line passing through a point and perpendicular to another? 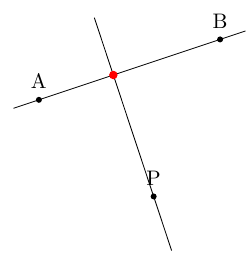 A straight line goes through points A and B. Another line is perpendicular to AB and goes through an arbitrary point P.
I fiddled with the |- operator but it only seems to work with horizontal or vertical lines. Is this even possible? Bonus question: when drawing AB, is it possible to let the line poke out a little? For example, when writing \draw (A) -- (B); the line strictly goes from A to B. I'd rather have a line passing through these points but starting 1cm in front of A and ending 1cm after B (for example). You can use the calc library for this, which allows to do coordinate calculations. The expression ($(A)!(P)! 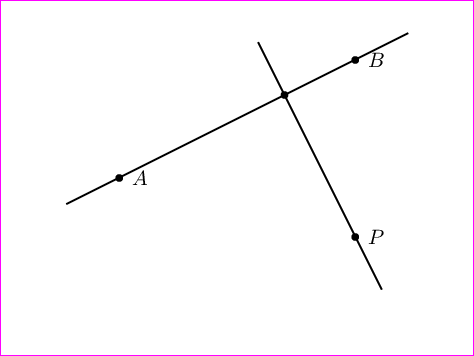 (B)$) yields the projection of (P) on the line from (A) to (B), for example. As Martin Scharrer points out, you can extend the lines by using the shorten > and shorten < commands with negative values. I'm using them here in a style called extended line that takes an optional argument to set the length by which to extend the line. EDIT: since tkz-euclide is on CTAN but it is not included in TeX Live (at least not fot the moment), you'll have to download the files and install them manually. 1) tkz-euclide is on CTAN but not on TexLive I need to upload the sources of the documentation. Just another simpler solution with PSTricks. To answer this question (click). 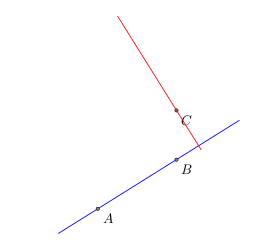 TikZ - How can I draw a line through a point on a line, with the new line perpendicular to the old line? 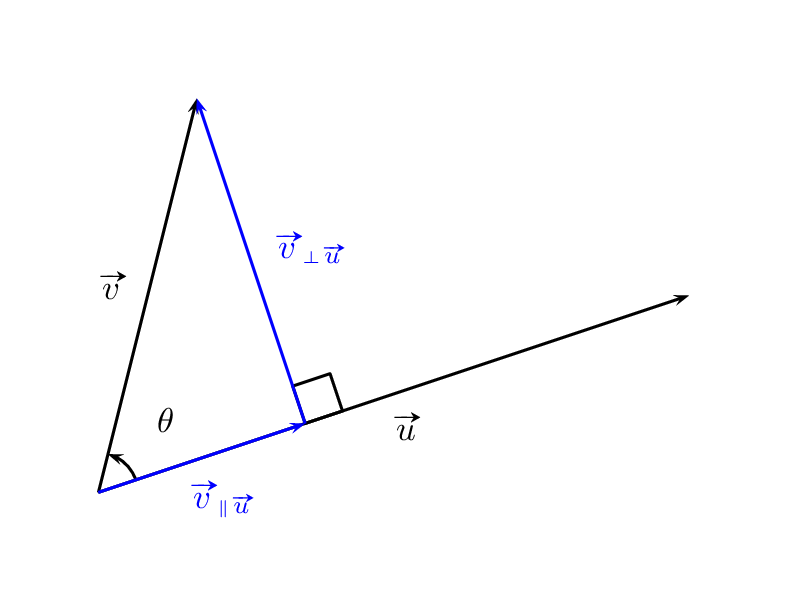 TikZ: how to find the intersection of two extended lines? Can I enlarge lines in TikZ? How to draw a line passing through a point and parallel to another?